Dan Burke emailed this photo taken in the pre-dawn backstretch flurry of activity this morning at Churchill Downs. 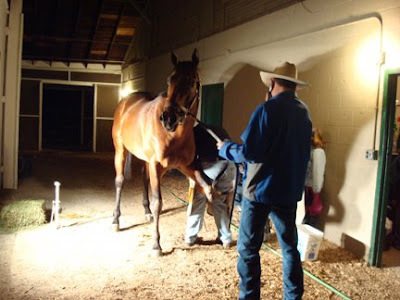 I believe that is trainer Larry Jones with his back to the camera, holding his horse, Friesan Fire, the current favorite for the 135th Kentucky Derby while Todd Boston adjusts his front shoes. Thanks, Dan!